Projects Abroad offers a wide variety of tailor-made elective placements overseas in developing countries. These have been designed specifically to meet the needs of students training to be doctors, dentists, physiotherapists, nurses and midwives. We have over 15 years of experience collaborating with medical professionals. We will provide you with a placement that not only meets your elective requirements but also gives you a full and rewarding experience of the country in which you are based. We arrange your accommodation, meals and insurance, and have strong in-country support to make sure your time abroad runs as smoothly as possible. why not let Projects Abroad do all the hard work for you? Our elective placements are available in developing countries around the world. 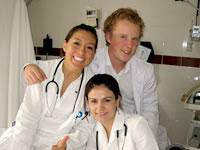 This is the basic checklist for a medical elective placement. In developing countries, students will see diseases and conditions that have long been eradicated from the First World, such as leprosy and polio. Furthermore, due to a lack of both general health education and money to pay for treatment, the cases that you see will tend to be far more advanced than you are used to from your time in western hospitals. Because of the limited resources available in the countries where we work, our medical colleagues are always glad of extra help - and this is likely to come across in the way you are received by the staff in the clinics and hospitals where you work, as well as the patients you work with. "I have loved every minute of my time on my elective placement in Mongolia, at times it has been frightening and frustrating but I wouldn't change a thing. It's a unique place that as a friend once said "gets under your skin" and I couldn't agree more. When I leave I will be sad to go but I'm sure I will find an excuse to return. I would certainly recommend Mongolia as an elective destination with a difference, the challenges won't be easy but for me the rewards were plenty." Medicine Electives available: Argentina, Bolivia, China, Ghana, Mexico, Mongolia, Nepal, Peru, Sri Lanka and Togo.